Raspberry Macaroons that are vegan and gluten free. I am loving all the spring produce! I picked up some raspberries to make these Raspberry Vegan Macaroons for you guys. They are super easy to make. Just a handful of ingredients and no cooking required! I think this might work with other berries as well. These Raspberry Macaroons are vegan, gluten free and also paleo approved! If you liked my 4 ingredient macaroons, then you will love these too. If you like healthy desserts, you may also want to check out my post about 20 healthy desserts with 5 ingredients or less. These take about 5 minutes to whip up. Then you just need to let them chill in the fridge. This recipe is also nut free for those that have kids with nut allergies. I added chocolate chips to mine, but you can omit those if you like. I just love the flavor combo of raspberry and chocolate. Just a handful of ingredients and no cooking required! In a food processor , combine all the ingredients except the chocolate chips. Once everything is mixed well, add the chocolate chips and pulse a few times to mix them up. 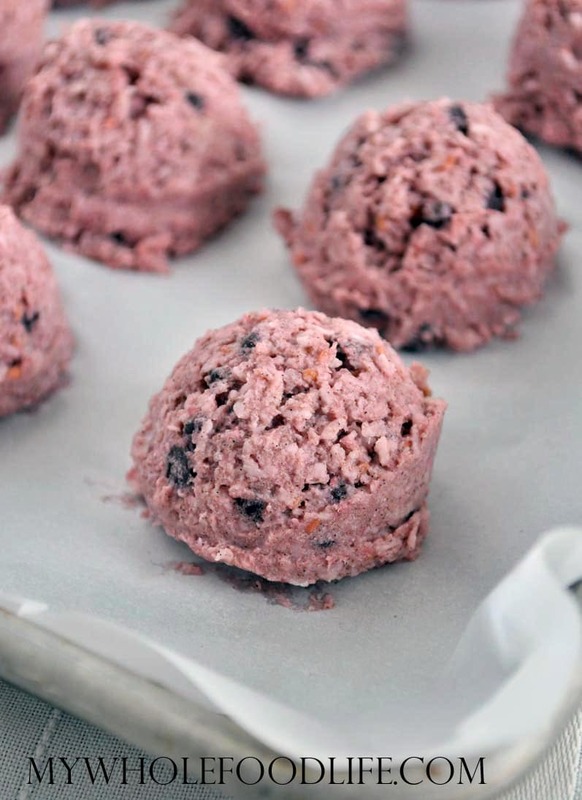 Use a cookie scoop to form balls and place them onto a lined baking sheet . Stick in the fridge to chill. About 30 minutes. These should last at least a week in the fridge. You can also freeze them for much longer. Enjoy! If you are using maple syrup to sweeten, can Karo syrup be substituted? Is there anything you can use to substitute the ground vanilla bean with? I don't have access to it and it's unavailable on Amazon. You can slice open a vanilla bean and scrape out the seeds to use. You can also use vanilla extract, but since this is not cooked, you may taste the alcohol. I'm just now seeing your reply. Thank you! You're welcome! Enjoy the recipe. I'm really enjoying the theme/design of your website. Do you ever run into any browser compatibility issues? A couple of my blog readers have complained about my site not operating correctly in Explorer but looks great in Firefox. Do you have any suggestions to help fix this issue? Thanks. No issues that I have heard about. Are you asking if you get use dried instead? I just made this recipe and it’s come out all runny? Did you use fresh or frozen raspberries?